Robert Mugabe’s successor wants to ditch the U.S. dollar and introduce a new national money. Its value is bound to dive but any benefits will be fleeting unless Harare can also slash a bloated civil service and break its serial addiction to printing cash. That is unlikely. Harare’s bourse leapt 66 percent this week even as global equities sagged. That reflects crumbling faith in cash and banks rather than confidence in the economy. The southern African country is in such a sorry state that shares are a rare source of sanctuary. Emmerson Mnangagwa has won the presidential elections. His challenge is to devalue the national currency while convincing global institutions to extend credit and tackle a spiralling debt load. That’s a big ask, but the country faces a dark future if he doesn’t at least try. The longtime Asia bull and Quantum Fund co-founder thinks the worst bear market of his lifetime is coming. He swung by our Hong Kong bureau to discuss the risks, as well as Trump’s Asia tour and why America could become its own worst enemy if it lets China dominate the region. The 93-year-old ruler is likely to be impeached after nearly four decades in power. He bequeaths an economy in urgent need of reforms. The most important – attracting foreign investment and restoring trust in the currency system – will happen over years, not weeks. An army takeover augurs change, but not a solution to the African nation’s economic problems, which include a bloated civil service and a currency crisis. Governments can change overnight, but bringing back human and financial capital – and fresh investment – is slow work. Basic economics - and decency - fall by the wayside in the administration’s pitch that it can create $2 trln of revenue by cutting $3.6 trln of costs. OPEC and U.S. fields battle for oil supremacy. Zimbabwe invents the zollar. And Bill Ford escapes his CEO’s crash unscathed. The African state suffered hyperinflation in 2007 after paying bills by printing its own currency. A decade on, it is doing so by printing U.S. dollars instead. The idea of conjuring foreign currency from nowhere with the tap of a keyboard sounds too good to be true – and is. The sub-Saharan state is issuing dollar-backed "bond notes" as a means of payment. 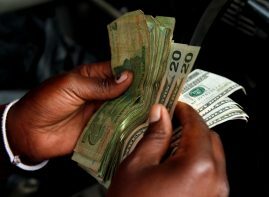 It's an attempt to ease the huge trade deficit which is sucking hard currency out of Zimbabwe. But it requires citizens to trust the central bank responsible for the country’s hyperinflation. The African nation is paying one U.S. dollar for every 35,000,000,000,000,000 of its old scrapped scrip. Zimbabwe is a byword for monetary disaster but the outcome is unusual. It shows it takes truly exceptional incompetence to create hyperinflation. Impala Platinum’s cave-in over control of a Zimbabwe mine is bad news for an already-struggling industry. Labour strife, deadly mines and spiralling costs make it hard for producers to earn reasonable returns on the white metal, despite high prices and an effective oligopoly.